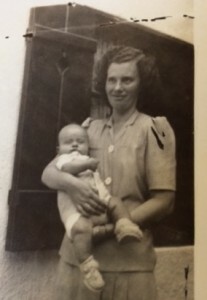 I had a great aunt who saved my life, though she never knew it. Nearly two decades ago, before my paternal grandfather died, I asked him to tell me more about his life. I was in my twenties and knew very little about him save for his superficial likes (hard work; peace and quiet) and dislikes (my brother and I trashing his flowerbed in a spirited soccer game). In the two-hour conversation which ensued, I learned a great deal about his parents, his childhood, and the experiences which shaped him into the responsible, hard-working man of few words which I knew. I also learned more about his only sister, the great-aunt who seemed strict, serious and never seemed particularly fond of children. When I was a kid, her stern demeanour always intimidated me, so I generally steered clear of her. Before the start of the First World War, my grandfather’s mother, Elisabeth, finished her basic schooling in Bad Mergentheim, Germany. She was bright and expressed desire to follow in her father’s footsteps by becoming a doctor. Out of concern for his daughter’s marriage prospects (because no man in his right mind would have married a woman with career aspirations), her father declined and suggested she study nursing instead, or travel and see more of the world. Disappointed, Elisabeth joined a friend and boarded a ship, setting out toward South America, where countries like Chile, Argentina and Peru had established German communities which could receive the young women. While Elisabeth and her friend were in Peru, WW I broke out, and the women were instructed to wait until the seas were safe enough to return to Germany. It was during the wait that Elisabeth met my great-grandfather, an employee of the Deutsche Bank, at the Lima Club Aleman (German Club). Approaching 30, she gave up her aspirations to become a doctor and decided to get married. They settled in Callao, Peru, and their three children were born there. While they did return to Germany so the children could learn German, the family always returned to Peru. 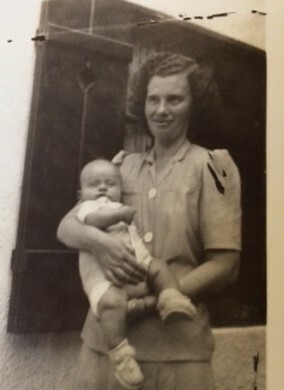 Great Aunt Susi, pictured while in medical school holding my father. Elisabeth’s only daughter, Susie, was a strong student early on and decided to pursue medicine, enrolling in medical school in the 1940s. I’ve been told her path was not an easy one. As a woman in a man’s field, she had to grow thick skin. Her fellow students were non too pleased with having a woman in their midst, and her time at medical school was spent working twice as hard to prove she belonged there. As her confidence and focus increased, so did her commitment to the fact that a career in medicine would not include a marriage. Later on, when my aunt (her favorite niece) asked why she had never married, Susi replied, “because I never found a man who was more intelligent than I”– a response which at first may seem arrogant, but that she may have had to tell herself to rationalize her difficult choices. I hear she had suitors, and one in particular she loved, but she decided it was not to be. Susi went on to become a renowned pediatric neurologist – the first female one in Peru. She built a respected practice and earned a teaching position at the medical school. Her fellow students, many of whom became her colleagues, came to respect the strong and sometimes unapproachable woman, seeking her advice in particularly difficult cases. “Whenever people speak of her, they either love or hate her,” my father told me in a recent conversation. Not unusual among groundbreakers, is it? In our family, Susi had a bit of a reputation for being tight-fisted with her money, which I have come to understand as her way of creating security for herself. In her generation, ladies generally relied on husbands and their savings for their old age, but she was on her own. When I was a kid, I would only see her during the Christmas holiday, and she would always gift us home-made lebkuchen cookies (which I loved) instead of toys. Her frugal ways never left her – when she was much older and clearly financially secure, she still instructed her beloved niece not to buy expensive chocolate. Our strengths can also be our weaknesses, and this was no exception for Susi. The same doggedness that got her through medical school and made her well-respected in her field sometimes prevented her from reconsidering her convictions. In one such case, Susi and my grandfather, by then in their seventies, feuded over something and stopped talking. Neither was willing to back down and the days turned to weeks, months and years. The siblings never spoke again and when my grandfather died, Susi wept in public for one of the very few times in her life. Susi also refused to see doctors her whole life, and the last time she diagnosed herself, it cost her her life. A mole on her arm was left to grow over years until it covered most of her bicep. “She always wore sweaters,” her niece said, “and by the time her nurse alerted me to it and I saw it, I knew it was not good.” She persuaded Susi to see a colleague, but it was too late: stage 5 melanoma. Her German skin had paid the price for living (and loving) the Peruvian sunshine. On one of the last visits to the doctor, Susi told her niece, “I know what I have, and I know how it will kill me. I also know it will not hurt much.” And she was right, of course. A brain metastasis killed her aged 88. While writing this piece, I Googled her name (something I could have never done when I was a kid and I used to wonder about her). Various journal articles come up in journals like the New England Journal of Medicine. It is strange to see her name in print, honored as the founding member of a medical school, attached to a grant for female doctors, or on a plaque at the medical school where she taught. To me, she was just the great-aunt who made the great cookies. I only remember speaking to her once, as an adult, when she was probably already ill. I remember her seriousness, her old sweater, her few words. We never really got to know eachother. Yet, for her few words, I owe her my life. Her death of melanoma made me aware that it could happen to me, so I started checking my skin in my thirties. When I found a small growth on my head, I made an appointment to get it checked out immediately. After the first doctor said, “I don’t think it’s anything but you can always go to a dermatologist.” I went, and it was something: stage II melanoma. My ancestor was (arguably) responsible for both for my illness and my survival. As I learned more about Susi’s life I pondered just how much our lives are colored by our parents and ancestors. Often we live reacting to our parents’ and grandparents’ experience – either riding their coattails or fighting to be different. In Susie’s case, did she enter medical school and remain unmarried to fulfill her mother’s dreams? Was she reacting to her mother’s bitterness about the loss of her own medical career and an unhappy marriage? Did Susi find happiness in being solely responsible for her success in life, or did her freedom feel like a lonely burden? As I examined her life, I felt strangely connected to her physical and emotional legacy. Regardless of how far we travel and how differently we live our lives, we remain connected to the thread of those who came before us, and not just genetically – but emotionally. The experiences of our mothers and fathers shape much of our experience, even if we are not aware of the subtleties. Consider your own life: how much of how you approach life and relationships is colored by what you saw, what you were taught, and what you interpreted as valuable or to be avoided at all costs? If we think hard enough, I’m willing to wage each of us can find a time when our actions were reactive to our own parents’. Just last weekend, I reminded a dear relative that she was not her mother–that her mother’s perspective and decisions are not her own, and what’s more, they should not prevent her from listening to her inner voice and making her own brave choices. I issued that reminder not because I’ve got this all figured out, but because I can never hear it enough myself. I am not saying our parents’ lives are filled with mistakes and warnings we need to avoid — not at all. But if we look closely at the experiences that shaped them, we can see what informed their choices and why they chose to pass certain learnings on to us. With this information, we can decide if their wisdom serves us, or if we need to go in search of our own; the answer is probably a little bit of both. While some may see Susi’s genetic gift as a terrible one, I don’t. A cancer diagnosis, treatment and remission changes everything about the way you live your life. And now that I have accepted Susi’s genetic gift, I am looking forward to whatever other gifts she and all my ancestors may still have for me to discover.